NASA's Mini-SAR instrument, which flew aboard India's Chandrayaan-1 spacecraft, found more than 40 small craters with water ice. The craters range in size from 1 to 9 miles (2 to 15 km) in diameter. Although the total amount of ice depends on its thickness in each crater, it's estimated there could be at least 600 million metric tons of water ice. The red circles denote fresh craters; the green circle mark anomalous craters. The traces of water in ancient moon rocks may share a common source with water on Earth, scientists say. If confirmed, the potential moon-Earth water link would add more support to thetheorythat the moon's material came from the proto-Earth, and that water in this material survived the aftermath of the giant impact thought to have formed Earth's large natural satellite, researchers explained earlier this month at the Lunar and Planetary Science Conference in Houston. Backscatter electron image of a lunar melt inclusion from Apollo 17 sample 74220, enclosed within an olivine crystal. The inclusion is 30 μm in diameter. Skeletal crystals within the melt inclusion are a fine mixture of olivine and ilmenite. Dark area in the lower-left is an ion microprobe sputter crater. The recent research instead concentrated on the possible sources of water in rocks from the lunar highlands. These samples make up some of the oldest moon rocks available for study and are thought to have directly formed from the moon magma ocean. Jessica Barnes, a PhD student in planetary and space sciences at the Open University in the United Kingdom, led the research. The presence of these volatile elements in magmatic rocks tellsscientists about the composition of the crust, mantle and atmosphere of a planet or moon. And because apatite is hydrogen rich, it suggests that water was present on the moon in the past. Researchers have found apatite in various types of lunar rocks.And whileprevious studies have analyzed this mineral in younger lunar rocks and pyroclastic glasses, these samples did not provide ideal material for understanding the original volatile composition of the moon soon after its formation, said Barnes' co-author Mahesh Anand, also of the Open University. "Because of their relatively younger age, [the rocks] could have been derived from portions of the lunar interior that had received additional water after the moon's formation," he said. The apatite-containing lunar rocks from the moon's highlands provide much better research material, Anand said. These are some of the oldest and most pristine materials available for laboratory investigations, he added. Barnes and colleagues analyzed apatite material from three highlands samples, collected by the Apollo 17 astronauts, for water content and hydrogen isotopic composition. Apatites are extremely rare in these lunar samples, and therefore they were not fully investigated previously, said Anand. However, they "have the potential to reveal the original history of water in the Earth-moon system because of their ancient age and close association with the lunar magma ocean crystallization products," he said. "By studying the isotopic composition of water present in these rocks, we can examine the history of water in the Earth-moon system closer to the time when these two planetary bodies formed." The scientists found substantial amounts of water locked into the apatite's crystal structure. They also determined the hydrogen isotopic signature of the water in these samples to pinpoint a potential source for the water. To measure the isotopic composition of water and hydrogen in the rocks, the team used an instrument called a nano secondary ion mass spectrometer. "We essentially drill tiny — less than a tenth of a millimeter — holes in our samples with an ion beam," said Barnes. The drilling process releases so-called secondary ions that detectors then collect. By measuring the amounts of these ions, the researchers determined the hydrogen isotopic composition of the water found in the apatite. "Different objects in our solar system have characteristic H-isotopic signatures. We can use the H-isotopic signature of the water in the lunar samples as a fingerprint that we then match to known values of other solar system objects," said Barnes. Researchers can thenuse these signatures to determine where the water in the lunar samples actually came from, she said. 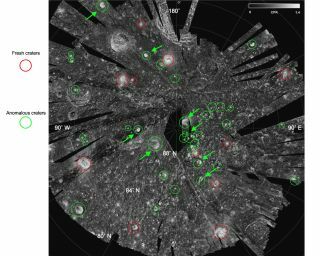 Having analyzed the signatures, the researchers noticed that the hydrogen isotopic signature measured for these lunar samples was comparable to that of some chondrite meteorites found on Earth. This means that such meteorites could have delivered water to the moon, said Barnes. And, she added, "the signature is also strikingly similar to that estimated for the Earth’s mantle, indicating that the water in the interiors of the Earth and the moon may share a common heritage." These images show a very young lunar crater on the side of the moon that faces away from Earth, as viewed by NASA's Moon Mineralogy Mapper on the Indian Space Research Organization's Chandrayaan-1 spacecraft. On the left is an image showing brightness at shorter infrared wavelengths. On the right, the distribution of water-rich minerals (light blue) is shown around a small crater. Both water- and hydroxyl-rich materials were found to be associated with material ejected from the crater. Credits: ISRO/NASA/JPL-Caltech/USGS/Brown Univ. The Earth-moon water link could be explained in two ways. First, primordial terrestrial water could have survived the aftermath of the giant impact thought to have happened about 4.5 billion years ago — the prevailing explanation for the origin of the moon. Second, a common source could have added water to the Earth-moon system immediately after the moon's accretion, Anand said. However, scientists should interpret such data with more caution before jumping to conclusions, said Larry Taylor, director of the Planetary Geosciences Institute at the University of Tennessee. "Mahesh had his students ... present fine studies of apatites and their water," he said. "But the interpretations of these values need considerable further constraints. They are doing fine studies with their present knowledge of the subject. However, it is now apparent that further scientific data and constraints are needed and will now be addressed." The research appears in the latest edition of the journal Earth and Planetary Science Letters. Follow Katia Moskvitch on Twitter @SciTech_Cat.Follow us at @Spacedotcom. We're also on Facebookand Google+. Original article on Space.com.